At Clairemont Equipment Company, we are dedicated to providing responsive service to our customers. Our Service Technicians are factory trained, professional and use state-of-the-art tooling and technology. You can depend on our representatives to keep your equipment operating efficiently. Our extensive Product Support staff will work closely with you to develop a plan of action specific to your needs, minimizing costs and downtime, while optimizing your equipment’s fullest potential. Clairemont Equipment Company provides on-site emergency service. Our factory trained and certified service professionals are equipped with fully stocked service trucks and have many years of repair and rebuild experience. Our factory trained technicians have lowered pre failure repair costs by over 30%. Let Clairemont Equipment your factory-authorized dealer, maintain your equipment. we have 3 service locations for your equipment repair and field service needs. We offer work bays that are fully equipped with complete tooling and specialized diagnostic equipment. Our service technicians are highly trained and dependable, we take the guesswork out of costly equipment repairs. We Provide the service you need to keep your machines performing at their best. Our repair and maintenance agreements enable you to budget for your future scheduled repair and maintenance costs up front. Based on your input and previous operating history, we can lay out a schedule of events and develop a forecast of “before failure” repairs, allowing you to maximize machine availability by minimizing unexpected failures. 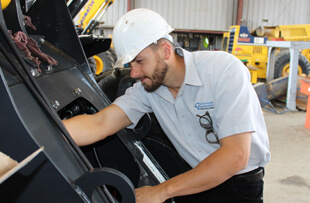 Some of these programs include: Preventative Maintenance Agreements: Clairemont Equipment Company offers complete periodic services on your equipment. From preventive maintenance inspections, to complete oil and filter changes, to PM clinics and tune ups. We can schedule the maintenance to take place at our location or on your site. The Komatsu Oil & Wear Analysis (KOWA) program uses independent laboratories across the United States to determine how your machine is performing, based on a small sample of oil or other fluids. KOWA tells you how your equipment is performing from the inside. Used with PM Pro, PM Clinic and PM Tune Up, KOWA is your best defense for proactively maintaining all of your equipment. KOWA detects fuel dilution and coolant leaks, identifies contaminants, and measures wear-metals. Clairemont Equipment technicians will help interpret this information. Regular sampling provides indications of increasing contaminants, so you can schedule repairs at the optimum time. For replacement components that deliver exceptional value, Clairemont Equipment Company provides components from our manufacturers' a state-of-the-art remanufacturing and rebuild facilities. These facilities are staffed with highly skilled, experienced craftsmen. All Komatsu ReMan and Wirtgen components are remanufactured to original OEM specifications. When a component is remanufactured, key parts are either remanufactured to original specifications or replaced with new OEM parts. Then, every component is tested to verify that it meets all OEM specifications. All ReMan components are backed by a same-as-new warranty. Linder is equipped to inspect, install, test and certify these components onsite. We supply a wide range of equipment parts: complete engines, long blocks, short blocks, cylinder heads, connecting rods, transmissions, power modules, torque converters, final drives, differentials, steering clutches, hydraulic pumps, hydraulic motors, hydraulic cylinder assemblies, hydraulic cylinder rods, brake band-caliper-shoes, fuel injection pumps, fuel injection nozzles, monitor panels, oil coolers, oil pumps, PTO assemblies, starters alternators, turbochargers, vibration dampers, water pumps and others. Linder knows that turnaround time is critical, and we offer many exchange components directly from our parts inventory. Using the latest advances in ultrasonic tooling and equipment, Our PSR will come out to your site and conduct a track inspection. Every track inspection is downloaded into our ECARE Management program which will identify abnormal wear and tear and maximize wear life. A total commitment has been made to infield service at Clairemont Equipment. Our factory-trained technicians are equipped with fully stocked service trucks and are available for both emergency maintenance and repairs. Our factory trained technicians have lowered pre failure repair costs by over 30%. Let Clairemont Equipment, your factory-authorized dealer, maintain your equipment. Our State-of-the-art equipment is carefully selected to provide the best possible service for our customers. Electronic and hydraulic test equipment., laptop computers, and other diagnostic tooling assist us in offering our customers the best service available. With the proper tools, our technicians can perform diagnostics quickly and complete repairs properly. » PM clinics available for all of your construction equipment. Let us help you optimize your machines performance with PM Clinics. » Three locations serving Southern California. For more information about our service capabilities or to schedule a service appointment, email our service department or call us!